Corvaja spoke of generally making decisions and visualizing new work as happening while he works on other work. I have also found this to be the case. This is why when I am most stuck, I will just sit down and make something. It may not be work with a particular goal in mind. I’ll try to continue abandoned pieces. I’ll make bezels for cabochon stones I have collected over the years without a finished piece in mind or I’ll make duplicates of pieces I’ve made before. It doesn’t really matter so much what I am working on as much as that I AM working. In in the very act of keeping my hands busy, my mind begins working in the background on new ideas and pieces. 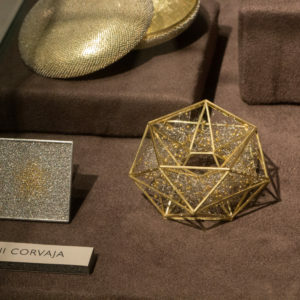 Naturally the idea of designing in the mind while the hands are working is something that resonated with me, but Giovanni Corvaja’s idea of art-making as an alchemical process is one has brought me to examine more of my own creative process. I interpret his words as the transformation of our impressions of the reality around us into our artwork. This is certainly a viewpoint worth considering as artists. You can find his insight at 10:58 in the my video interview with Giovanni Corvaja. Here is the transcript of that portion if you would rather read it, but I will add that the rest of the interview is quite inspiring as well. Can you talk about your creative process and the decisions that you make when you are designing a piece? Actually I tend not to design a piece. It’s not that I sit down at a table and I decide Ok the next piece is going to be this and this. I do not draw anymore, I tend to visualize my pieces in my head. And somehow after doing making my work for a few years, I stopped needing to make drawings. I do make drawings when I need to calculate proportions and just need to get sizes mainly. I usually form and figure an object when I’m working on other works. And generally what I like to I like to consider the creative process as a process of transformation. Basically you transform a suggestion or an idea which comes from the reality. Because we are immersed in reality and we get a lot of inputs from the reality and we transform it into feelings and memories to something abstract and then the design process is actually the materialization of this abstract concept. So it’s actually very much like the alchemical process- the alchemical job, which is transforming what is invisible into visible and what is visible into invisible. So basically the reality, which is what inspires us, becomes an idea we extract the essence of the reality. And then we transform an idea into something real because an object of art is something tangible. And this is, in a very abstract way, the process. And then there is a matter of how we express that and here comes the language which is the technique and the skill. The technique is actually what allows us to express and to transform this immaterial entity, which is our idea, into our message into a real object. What is considered the first book of alchemy which is the book by Hermes….It actually says this, it simplifies the whole science into one law. -You have to make what is visible into invisible and what is invisible into visible. It makes sense in many aspects of the human activity, basically.